Send It In Jerome: Is the Return of the Tribe For Real? At the risk of using a word that no longer exists within the city limits of Cleveland, the most “optimistic” Indian fans spent the month of March hoping for a wild card berth. Maybe a handful of season ticket holders thought they could steal the AL Central pennant, but certainly no one thought they would finish the month of April with the best record and the highest run differential in the majors. Now, before I dive into this “analysis,” I feel as though it needs to be made clear that I am neither a diehard supporter nor hater of the Cleveland Indians. It pains me this year to admit that I’m a Houston Astros loyalist, but as a lifelong fan of the sport of baseball on the whole, I hope to supply a relatively unbiased opinion on what we’ve seen thus far from the Tribe. And honestly, was there any way to foresee this happening? I mean, come on, Orlando Cabrera is playing for his sixth team in the past five seasons, but after playing 1800 career games at shortstop, he’s hitting and fielding like an all-star candidate at second base. Travis Hafner hasn’t hit for better than .278 since 2006, but he’s currently batting better than .340. Grady Sizemore didn’t hit a single home run last year, but he’s already belted four long balls in just fifty at bats. And I don’t even know what an Asdrubal is, but for something that sounds like a side effect of diet pills, the kid can sure play ball. And as far as the pitching staff is concerned, I would be thoroughly impressed if you live outside of Ohio and can actually name an Indians’ starter aside from Masterson or Carmona, each of which has been nothing short of a mixed bag of success over the years. So how exactly did this hodgepodge of no-names and afterthoughts get off to a 19-8 start to the season? And if the group of misfits from San Francisco could win a World Series last year, is there a ceiling for the Curious Case of the Cleveland Indians? Sure, Cleveland has had some success in the past, but it’s been awhile; and they certainly don’t have the same fire power as their predecessors. Behind the likes of Kenny Lofton, David Justice, Manny Ramirez, Jim Thome, Matt Williams, Orel Hershisher, Bartolo Colon, Jose Mesa, and several other names that most of us probably associate with other franchises altogether at this point, the Indians became a staple atop the AL Central during the latter half of the 1990s. Since then, we’ve seen Detroit, Minnesota, and Chicago take turns winning the pennant for the majority of the past decade, while Cleveland has failed to play better than .500 baseball in seven of the past nine years. The Tribe did make one trip to the ALCS in 2007, but since CC Sabathia took his talents to the Big Apple following that season, the Indians have struggled mightily; and in each of the past two seasons, they barely even flirted with mediocrity. But already in this cockamamie 2011 season, they’re winning the types of games that we’ve grown accustomed to watching them lose. Three straight wins in their final at bat? Against the Tigers? A year ago, that kind of streak is incomprehensible for the Tribe. Now, it’s become the norm. And in a season where blown saves occur about as frequently as stolen bases, Chris Perez has successfully converted seven out of eight save chances, and has actually looked pretty solid in the process. The particularly puzzling thing about this Indians team is how hesitant the talking heads are to label them as legitimate, especially after how eager they were to stick a fork in the Red Sox after a 2-10 start to the season. As I tend to save my “judgment” of a team until at least 40% of the season is in the books, I’m not yet saying that one or the other is particularly true, but if you’re going to overreact to the train wreck, it would only be fair to praise the masterpiece. Let’s face it: Cleveland doesn’t exactly have a whole lot going for it in the world of sports these days, and yet analysts refuse to throw them a bone when they deserve one. Their start has been so torrid that it’s not much a stretch to say that half of their regular starters are on pace to shatter career bests in significant categories such as batting average, home runs, stolen bases, ERA, WHIP, and strikeouts. But can they collectively keep up this pace? Because at the end of the day, a good start is just that: a start. Being the chip leader at the end of Day One of the WSOP Main Event doesn’t guarantee you a spot in the money, and neither does being the MLB wins leader at the end of April. There’s an old saying in baseball that you can’t win a pennant in April, but you can sure as hell lose one. In that line of thinking, I crunched the numbers from the past nine years and found that ten out of last the twenty teams that held at least a share of first place in their league at the end of April ended up making the playoffs. Additionally, of the teams that had built at least a two game lead in their division by the end of April (the Indians currently lead the AL Central by 4.5 games), 10 of 21 made it to the postseason. So, of the teams in the shoes the Indians currently wear, roughly half went on to have successful seasons while the other half unceremoniously fell out of contention. 50% is literally the furthest thing from conclusive evidence to statistically determine their current chances of playing in mid-October, but a coin flip is a lot better than their playoff odds were at the start of the season. All that being said, I really like the Indians’ chances of winning the AL Central. They’ve got a long way to go (135 games to be exact), and I sincerely doubt they’ll convince me that they can win the whole kit and caboodle. But in the opinion of this particular member of the know-nothing party, the AL Central is theirs to lose; so long as a few things work in their favor. This is far from groundbreaking analysis, but one of the primary keys to the Tribe’s success will be avoiding the injury bug. My reasoning for pointing out the obvious is twofold. The Indians appear to be one of those proverbial teams that meshes well and wins more games than they reasonably should because they’re “just having fun out there.” It goes without saying that every team has at least one guy that they really can’t afford to lose to the disabled list, but on a chemistry type of squad like this, any sort of injury can have a catastrophic effect on their mojo. And that isn’t even taking into account the statistical backlash of having to pencil the sub-.240 career batting average of Shelley Duncan or Lou Marson into the daily line-up. In addition to the chemistry factor, it’s crucial that they avoid injuries in order to subsequently avoid the “here we go again” mindset. In 2010, every American League team had at least six ball players appear in 100 or more games; except for the Indians who only had four such players. Granted, mid-season trades would have played a minor factor in that statistic, but the fact remains that Shin-Soo Choo was the only Indian to appear in more than 76% of the team’s games last year. And they were only marginally healthier during the 2009 season. I don’t know what’s in the water in Cleveland, but they may want to start adding some multivitamins to it, because a string of injury-riddled seasons like they’ve been having can really start to wear on a team’s psyche. If you don’t believe me, ask the Washington Redskins. 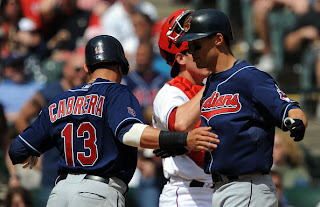 Beyond avoiding the occasionally unavoidable injuries, one of the biggest concerns for the Tribe will be getting consistent production out of their corner infielders. If Jack Hannahan can keep his strikeout rate below 30% and if Matt LaPorta ever lives up to the expectations that the fantasy experts have had for him for the past few years, Cleveland’s line-up from top to bottom would arguably be the best in the AL Central. That’s the really scary thing about this team: they’re already leading the AL in runs scored and we have yet to see LaPorta or even Carlos Santana really tap into his potential. And considering he’s batted .300 or better in each of the last three years, do you really expect Choo’s average to stay at .250? So long as Hannahan doesn’t become a strikeout liability, to whom in that line-up would you feel comfortable pitching? They may not have any names on their roster that are more recognizable than Sizemore or Hafner, but rest assured, their ability to hit the ball has not been an accident. I’m not nearly as confident that the pitching staff will withstand the test of time. In the 25 games since getting shellacked in the first two outings of the season, the Indians’ pitching staff has only once allowed its opponent to score more than five runs in a game. Considering they had allowed 4.99 runs per game over the course of the previous two seasons, the three runs per game they’ve permitted over the past 25 seems just a little too good to be true. The guys that many fans have heard of are not the ones I’m concerned about. If able to put it together for a prolonged period of time, Masterson has the stuff to be an ace, and Carmona could rival Derek Lowe for the best sinker ball in the league; we’ve at least seen glimpses of both of those things in the past. And Chris Perez has had closer material since his first month in the big leagues over three years ago. That leaves the other portion of the starting rotation and the middle relievers as the pieces with massive question marks. Tomlin, Carrasco, Talbot, Pestano, and Sipp have a combined eight years and 515 innings of experience between them, but they’ll be expected to carry their fair share of the pitching load over the course of the season; and two of them have already landed on the disabled list. Even if they were able to get and stay healthy, how often do young pitchers actually hold up well for an entire season? Mike Leake looked like a Greek god up through early June last season before hitting a wall and imploding. Strasburg lasted just nine starts before physically falling apart. It’s almost easier to find the exceptions to the rule, which last year would be pretty much just be Mat Latos and Jaime Garcia. And yet the Tribe has little choice but to bank on young confidence, ligaments, and rotator cuffs. To be fair though, with very limited exceptions, doesn’t every team in the league have doubts about its “second-rate” starters and/or its middle relievers? The Florida Marlins have the second best record in the majors, but do you trust anyone on their staff beyond Josh Johnson and Ricky Nolasco? I sure don’t. So yes, I have my doubts about the young guns at the back end of the Indians rotation, but that isn’t to say I don’t think they have potential, or that I wouldn’t swap their pitching staff for the Astros’ pitching staff in a heartbeat. The biggest thing working in Cleveland’s favor right now is the relative lack of competition they’re dealing with in their division. I’m ignoring the Royals, because, well, do I really need to justify thinking that they’ll find a way to finish in last place in the division as usual? Anyway, ignoring the Royals, the Tribe has an eight game lead on its usual competition, each of which has major concerns of its own: the White Sox can’t hit, the Tigers can’t pitch, and the Twins are a walking hospital ward. The naysayers will point out that they’ve played a less than daunting schedule thus far, and that they haven’t played all that well on the road, but I’m a believer. Besides, with the 2011 that Charlie Sheen has been having, who am I to doubt in the team that created the Wild Thing?